If you’re like the great majority of English learners from beginners to advanced levels, you use WILL way too much when talking about the future. Using WILL all the time is not the worst habit in the world, and if you’re a beginner or intermediate student, it can be a great “crutch” (support mechanism) for your conversational skills, but it prevents you from communicating the subtle aspects of your future plans, intentions, and schedules. If your English is at least at a conversational level, it’s a great time to start diversifying your repertoire of future forms. A good way to start doing this is with “going to” (to be + going to + verb) and its variation, “gonna,” as we talked about in the last article in this series. Another way, as we will talk about today, is to learn the ins and outs (the details) of WILL. Before we discuss the uses and pronunciation of will, I am going to explain the problem with using WILL too much, and how it tends to make you sound like a beginner or intermediate speaker, even for advanced and fluent speakers. Technically, there’s nothing wrong with using WILL all the time. It can even be a good thing for some people. It is useful because it’s simple, easy to learn, and it works in a very concrete way. But there comes a time when you have to leave behind your crutches and learn to imitate native speakers. So what are some of the problems people have? 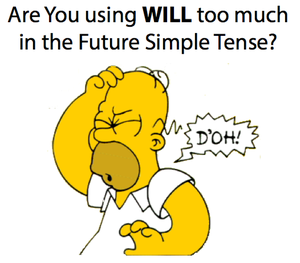 English learners tend to oversimplify the use of “Will,” and use it to talk about everything in the future because they feel comfortable using it. Other future forms are more complicated, and can demand a deeper intuition about the language, which requires more contact with native speaking sources. Two surprising secrets that make the future use of WILL more problematic are the awkward (strange and uncomfortable) pronunciation of the contractions. 1. English learners of all levels generally have a hard time pronouncing and using contractions the way they are taught in school. 2. Most students never really learn, or pay attention to the fact that native speakers (at least Americans) pronounce these contractions in a completely different and surprising way than students learn. *NOTES: The sentence “we’ll talk later” is pronounced “Will talk lader.” It seems like we are eliminating the subject pronoun (we), but is this is not the case. 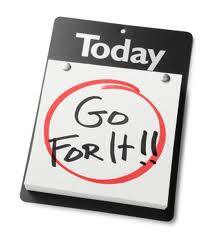 We will = We’ll (prounced “will”). Another important thing to know is that we don’t write this way. Rachel’s explanation, which starts at 6:25 in video, does a great job explaining many of the aspects that we talked about above. As Rachel talks about in the video, the “ll” contraction is considered a dark L sound and therefore pronounced as a vowel-like “ul” sound. Depending on your native language and culture, learners generally have difficulty with this. There are instances where the pronunciation of certain ‘T’ sounds becomes ‘D”. This is called a Flap T. See explanation below. I’ll call you later if you’ll give me your number (“all” call you later if “yull” give me your phone number). * “What will” is pronounced “whad-ul” because of the American flap D pronunciation rule. In American English, when a “t” is between two vowel or vowel-like sounds– it is pronounced as a soft D- like “better,” “later,” “Seattle.” Read more about this common pronunciation rule. The following situations are spontaneous decisions with no prior plan before the time of speaking, or when the speaker volunteers to do something on the spot (at that moment). When you make a promise about the future. Will is often used with Think. This expresses a desire, or even a preference for a future action, but it’s not as strong or certain as other future forms. I think I’ll go to New York on vacation. Do you think you’ll go to the party on Saturday? Asking if you have the intention. I don’t think I’ll go to work today. “I don’t think” here is often a way to politely decline to do something. It will rain on the weekend. No clouds in the sky. If I were to say, “it’s going to rain on the weekend,” I have some evidence, like clouds. Brazil will win the world cup. No evidence. If I were to say, “Brazil is going to win the world cup,” I have some evidence or reason to believe this. You will do great on the test. No evidence. It’s more based on faith. If I were to say, “you’re going to do great on the test,” I have some evidence or reason to believe this. The verb “to be” is often an exception to the rest of the rules/tendencies with “will.” You can use it even if you don’t have a firm plan and are not speaking spontaneously. Check out the Terminator “I’ll be back” clip! How to Apply What You’ve Learned! We would love to hear from you in the comments. Take care! Wow I really liked this article very simple… I liked the explanation..the audio was a good bull's-eye on this article makes me understand everything! and good work darling the best of luck! good work for real! The best set of explanations ever guys! I'm amazed! JJ, Thank you for the nice comment! It's nice to know that it's helpful. Thank YOU! Thanks Diego, I really appreciate your feedback! I'm glad it was useful. It's very useful for my Ss. Like it a lot. I absolutely LOVE that mind map! Will be printing it out. a simple article, very usefull, thanks dear! Absolutely amazing! You encompassed a lot of aspects of the subject in one single article in a very didactic way. Congratulations for the quality and thanks a lot for sharing. 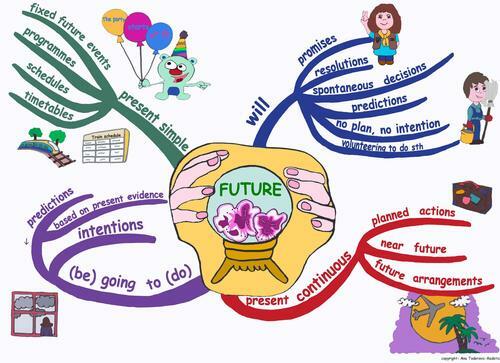 The article is complete of what we need to know of future tense: "will and going to". I wish you keep doing that so natural like drinking water after runing in the park. Thanks João. I’m really glad this stuff is useful for you! Thanks for another nice comment. Thanks Hernita, I’m glad it was helpful. I really appreciate the comment! Take care. "if you “guys’ul” want to go with us" Not all americans speaks like that. That sound more like southie people. I lived in Boston for 12 years and they don´t contract the WILL like in the text. Great article by the way! Thank you Justin! As always i can understand perfectely. This article open our mind to paying more attention in the contractions. Good article. Hey Zulmira, Thanks for reading and commenting! I'm glad it was useful for you 🙂 Have a great day!